When it comes to small mixers, there’s plenty of choice from the likes of Mackie, Yamaha, Samson, Behringer, Soundcraft and Alesis — and the latter’s InMusic stablemates, Alto, who have managed to cram a lot of enticing features into this little (305 x 346 x 80 mm) desk. Onboard DSP effects are nothing new perhaps, but the Live 802 also includes a pair of analogue compressors, a nine-band graphic equaliser (which can be deployed in either the main output or the monitor aux send), plus the option to record and play back stereo 24-bit mixes over USB using an Apple Mac or Windows PC. While many of the smaller mixers I’ve tested have four mic/line channels and then one or more stereo line-only channels, the Live 802 actually has five mic/line channels with XLR and jack inputs, with the first four channels also having pre-EQ insert points on TRS jacks. Channel 5 can double as a stereo line channel (5/6) while channels 7/8 are fixed as a stereo line-input pair. Each channel has a three-band EQ, a post-fader effects send and a pre-fader monitor send. All the mic/line channels have switchable 75Hz, 18dB/octave low-cut filters, and all channels have pan controls, mute buttons and faders. Phantom power for the mic inputs is switched globally. A further top-panel USB socket is provided purely to power lamps or charge mobile devices. Those compressors on the first two channels have just one knob each for ‘more or less’ compression, with an amber LED giving an indication of how much compression is being applied — similar to the system used on some Yamaha mixers. There’s a headphone outlet with its own level control, and for controlling the channel and master levels there are 60mm faders rather than the rotary pots typically found on compact mixers. With its largely metal case (the end cheeks are plastic) and clearly colour-coded controls, the mixer has a robust feel, and the use of an internal power supply further helps make the whole thing feel more serious. An IEC mains cable plugs into the back and you’re good to go. A pair of 12-segment LED meters show the output level, with further LEDs indicating mute, signal peaks and phantom power status. The mic amps use what Alto call their DNA circuitry, and these are specified as having a flat response from 20Hz to 20kHz (+0.5dB), with distortion below 0.005 percent at 1kHz/0dBu. Up to 45dB of mic gain is available, with an additional 20dB of gain possible via the channel and master faders. The signal-to-noise ratio is quoted as a healthy 105dB. All three EQ bands offer a ±15dB gain range (the frequencies are 80Hz, 2.5kHz and 12kHz), while the graphic EQ operates at 63Hz, 125Hz, 250Hz, 500Hz, 1kHz, 2kHz, 4kHz, 8kHz and 16kHz, again with a ±15dB gain range. When it comes to those all-important effects, there’s a choice of 100 Alesis-designed presets (arranged as 10 types with 10 variations of each) that provide a wide choice of delays, reverbs and reverb/delay combinations, as well as an assortment of modulation treatments. The programmes are selected via a turn-and-press rotary encoder. There’s a DSP mute button in the effects section as well as a two-digit display and a panel listing the effect categories. However, there’s no delay tap-tempo button, which is something I’d miss, though there is a remote jack for bypassing the effects using any standard footswitch. In the master section, below the graphic EQ and effects sections, are separate faders for the effect return, the aux return, the monitor out and the main stereo out, each with its own mute button. Both aux sends have physical jack outputs allowing the use of external effects should they be preferred to the built-in ones, and two aux return jacks are provided for the return of stereo effects, though they could also double as additional basic line inputs. Rotary controls and selector switches are used for the two-track return in, USB input and headphone output. The two-track and USB returns may be sent to either the main out or the cue out, and the headphone out may be sourced from the main output or the cue mix. Rear-panel connectors are available for the main outputs (on both balanced XLRs and jacks), control-room out (on jacks, controlled via the headphone level control) and the two-track in and out (on phonos). The main USB port is also on the rear panel, along with the power inlet and power switch. The internal switch-mode PSU can run from 100 to 240 V at 50 to 60 Hz. 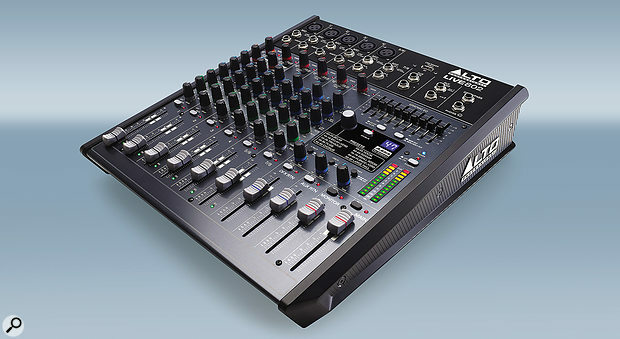 So much for features then, but how does the mixer perform in real life? As the mic amps have a maximum of 45dB of gain, the input gain control needs to be set around three-quarters up to record speech using a dynamic mic, or around halfway up for close-miked vocals. If the compressor is used, the level increases slightly and the voice takes on a fatter, more solid character, though in a live situation compression always has to be used with care as it reduces the level you can achieve before feedback sets in. As long as you pay attention to gain structure by setting the input gain control appropriately, the sound is clean with the EQ mid frequency being in a good spot for tweaking vocals. Having a nine-band graphic EQ is also a bonus, and though nine bands aren’t really enough for serious feedback suppression, it is flexible enough to use for matching the overall PA tonality to the room acoustics in a typical gigging situation. The USB recording side of the mixer is also very straightforward and clean sounding, with the Live 802 showing up as a generic two-channel USB codec. Playback level can be controlled in the mixer’s master section. That leaves the effects, which certainly have that bright Alesis quality about them, with a sensible range of reverbs and a selection of repeating delays with various delay times. I think the combined reverb and delay treatments or the plate reverb bank may be of most use in a gigging context, though there’s also a bank of specific vocal treatments that includes slapback delays and short, bright reverbs. I wouldn’t often need rotary simulations, flanged reverbs or large halls when gigging with my own band, but it doesn’t do any harm to have them available. In all, the Alto Live 802 inspires confidence and offers pretty much all you need in a small mixer, other than tap tempo for the delay treatments. Having real faders makes the mixer footprint a little larger than something like a Behringer 1202FX, but it’s still nicely compact. Its effects sound serious, the audio path is quiet with adequate headroom and, importantly, the control surface is clearly set out and intuitive to use. I like the idea of the USB light port on the top panel, while the rear-panel USB interface makes it easy to record gigs or rehearsals. 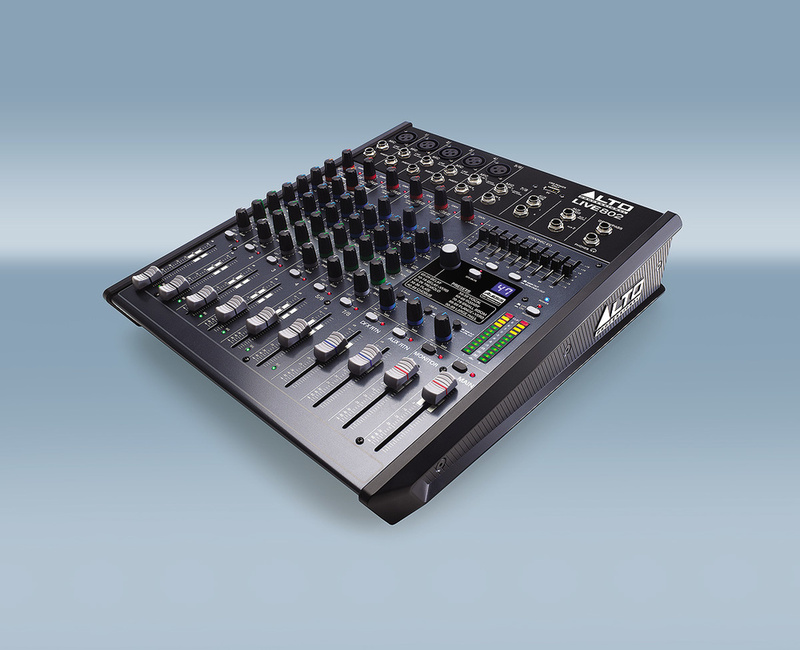 There are many similar mixers around, and even a few that combine internal effects with USB recording and playback, but most competitors only do so at 16-bit resolution. Spacious layout while still being compact overall. Good feature set including very usable effects. Mains powered — no external PSU to break or lose. A very practical little live-sound mixer that could also find some studio applications.